The Navy Museum at the Washington Navy Yard. Episode: 9. Site Number: 046. Date Posted: 27 May 1996. Location: Washington, DC, USA. Type: Museum. This being Memorial Day it's appropriate that we visit the Washington Navy Yard in Washington, D.C. You'll find there the Navy Museum http://www.history.navy.mil/branches/nhcorg8.htm, a cavernous warehouse full of interesting exhibits including a large one devoted to polar subjects, both north and south. Byrd's famous hut (Alone) is recreated, and there is on display a variety of odds and ends such as radio equipment, clothing, and the original stove with kerosene burner that almost led to disaster. On the roof of the hut are two stuffed penguins: an Adelie and an Emperor. 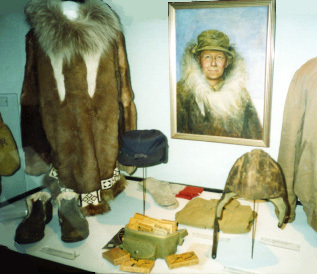 Included in the exhibit are polar medals, extensive collections of Finn Ronne and Byrd memorabilia, a 1965 1"=100' model of McMurdo Station, numerous examples of expedition china and even Byrd commemorative wood matches and paper cups and two tires from a Ford Trimotor. There's both an oil portrait by J. G. Cowell of Byrd and and a 30-inch high statuette (by deWeldon from the looks of it). Some Scott items are on display, too: a Wilson watercolor, a telescope with Scott's name engraved on it and several items (a theodolite, a film container and chocolate) lent by the Mariners Museum in Newport News. There are two fine ship models: The Flying Fish (Wilkes) and the Astrolabe (Dumont D'Urville) crafted of ivory. 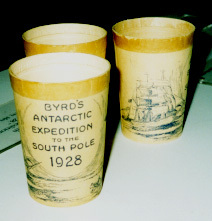 A large collection of papers and artifacts concerning both American and British Antarctic exploration are at the Navy Yard, catalogued but not on exhibit. Charles Wilkes' pistol is here as is his copy of the History of Greece (London 1829), not to mention a cake of hand soap and a box of matches from Shackleton's hut at Cape Royds, a wood fragment from the bow of Ross's HMS Erebus and a variety of food rations from Scott's last expedition. My guess is that this collection--displayed and otherwise--qualifies as the largest in the U.S.